Restaurant Virginia Beach: How Do You Like Your Steak? If you’re like us, you’re a diehard steak fan. 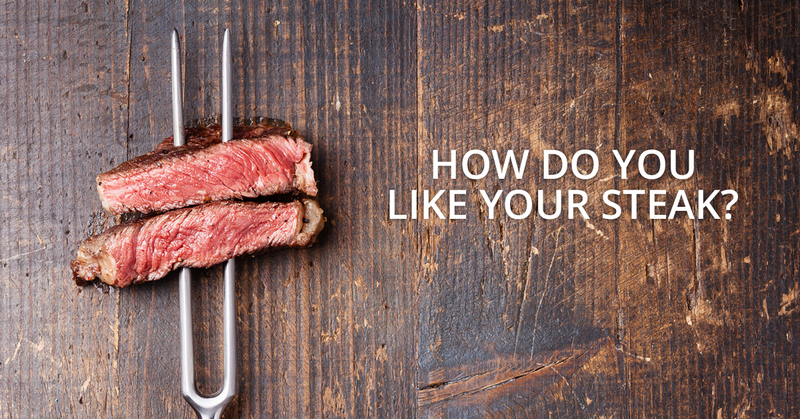 When it comes to ordering a steak at a restaurant, we know that this might feel like a gamble to steak lovers: Will the steak be cooked correctly? Will it meet your every dinner desire? When you trust FIREBREW to prepare your steak dinner tonight, you can be sure that you’ll leave with a belly full of delicious meat and a smile on your face. We have compiled some of our favorite steak facts that might influence your choice when you stop in to see us tonight! How Do You Order Your Steak? Porterhouse steak and T-bone steak are not the same! They might look the same, and both might be part filet mignon and sirloin, but you get more bone and less meat with a T-bone. Filet mignon does not need to be aged in order to taste incredible. In fact, it is so lean that there is no fat to break down. The aging process becomes unnecessary. Don’t be afraid of too much seasoning, especially if you have chosen to grill your steak. Most of the heavy seasoning falls off during the grilling process. When making your own steak, it’s crucial to check that the heat source is hot enough. Giving your grill time to preheat is important to starting your cooking process off at the right temperature. If it’s hot enough, you shouldn’t be able to have your hands over the grates for more than two seconds. That’s why we cook all of our steaks in our 600+ degree open deck oven! Memorial Day is the biggest day for beef sales in the United States. Yes, this is even about the Fourth of July or Labor Day! With this holiday coming up, keep that in mind if you’d like to enjoy a thick steak! Nearly 28 percent of all people who order steaks at restaurants also order a baked potato to go along as a side dish. The cost of beef rises when there is a drought. Think about it: The less water there is, the less grass there is. That typically means that farmers need to purchase more expensive feed, such as hay or corn. When cooking your steak at home, you can check to see if it’s done by using the finger test. Without using any force, bring the tips of your pointer finger and your thumb, then feel the thick, fleshy area underneath your thumb. That’s what a rare steak feels like. However, a medium steak feels like the flesh below your thumb when you press the tips of your ring finger and thumb together. If you need to know what well-done feel like, try the same trick with your pinky finger and thumb. Flat Iron Steak – This steak is 8 ounces of Angus flat iron grilled to our perfect temperature and then topped with a red wine mushroom sauce. As a side, we offer garlic mashed potatoes and roasted vegetables. Bacon & Blue Steak – You can expect 8 ounces of certified Angus flat iron steak topped with Applewood bacon, blue cheese crumbles, and a red wine mushroom sauce. This dish is served with garlic mashed potatoes and roasted asparagus. Ribeye Steak – This delicious 12 oz. certified Angus ribeye steak is topped with a blend of roasted garlic, stone ground mustard, and rosemary. We serve this dish with roasted red potatoes and asparagus. Porterhouse Pork Chop – Our incredible 12 oz. grilled bone-in Porterhouse pork chop is topped with a honey Chipotle glaze. We serve it with roasted red potatoes and Brussels sprouts. Come to Our Virginia Beach Restaurant Tonight! When it comes to having the perfect steak for dinner, trust FIREBREW Bar & Grill. We know that we can cook your steak to perfection. How do we know? All of our food is cooked in our 600+ degree open deck oven. We can keep a close eye on the steak and ensure that it meets even your highest expectations. Stop in tonight and try one of our four delicious steak meals for yourself! We will see you tonight.